And so we continue our look through the mirror, darkly. 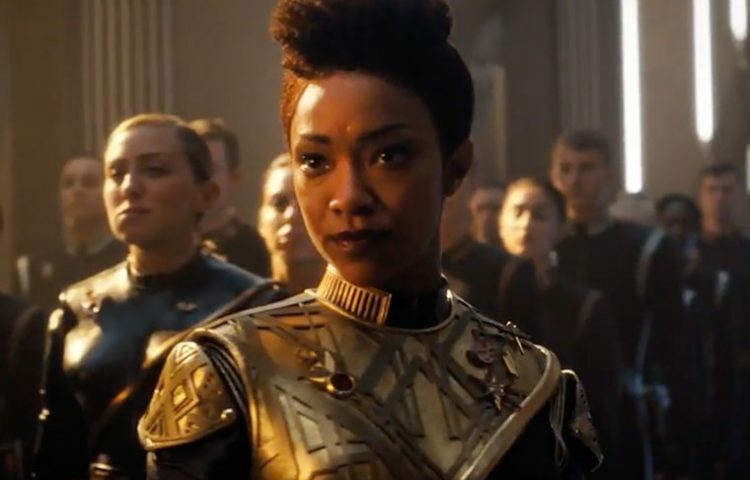 Star Trek: Discovery kept its pace at warp speed, as a major plot theory is revealed and we see some major developments on multiple fronts. But questions still remain. The Discovery crew continues its time in the Mirror Universe, and at the end of the last episode, we see a familiar face at the head of the Terran Empire, much to Michael’s chagrin. 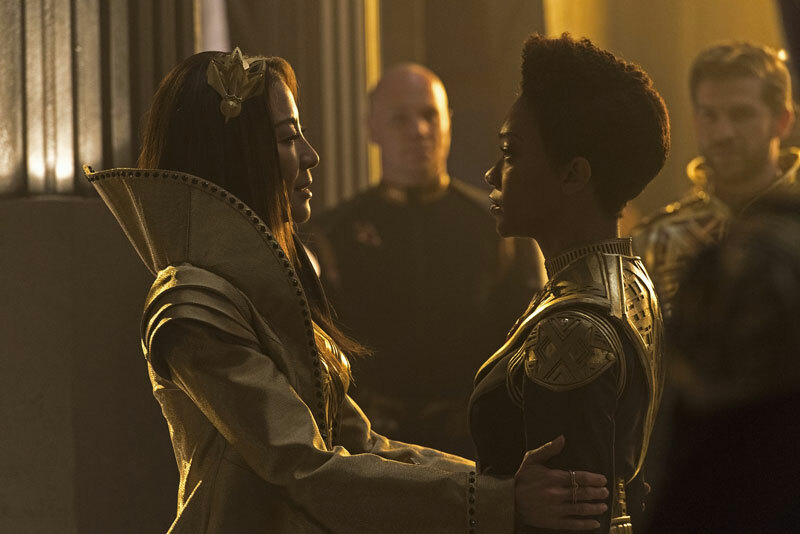 That’s right, Michelle Yeoh is back as her Mirror Universe counterpart, Emperor Georgiou. This ruffles Michael’s feathers a bit, considering the strong bond she and Prime Universe Georgiou shared. Threatened with death, Michael ultimately entrusts herself to Georgiou and explains the Discovery’s situation, which by itself is a questionable move. The Emperor notes that if Michael can trust her former captain, then she can trust her, Michael’s adoptive mother. Michael quickly acknowledges this logic. That was easy, yeah? Perhaps this exchange was hastened to move the plot along, but one might assume it’d take more convincing to trust your enemy, knowing what Michael knows about the Mirror Universe. It won’t be surprising if this alliance comes back to bite Michael. Time will tell. But one thing is for sure. Those two actresses are playing off each other better than they did in the first couple episodes, an impressive feat considering the complicated relationship and Yeoh’s absence from the show. Speaking of uneasy alliances, “Vaulting Ambition” brings a major reveal, one that fans have theorized since the beginning of the show. 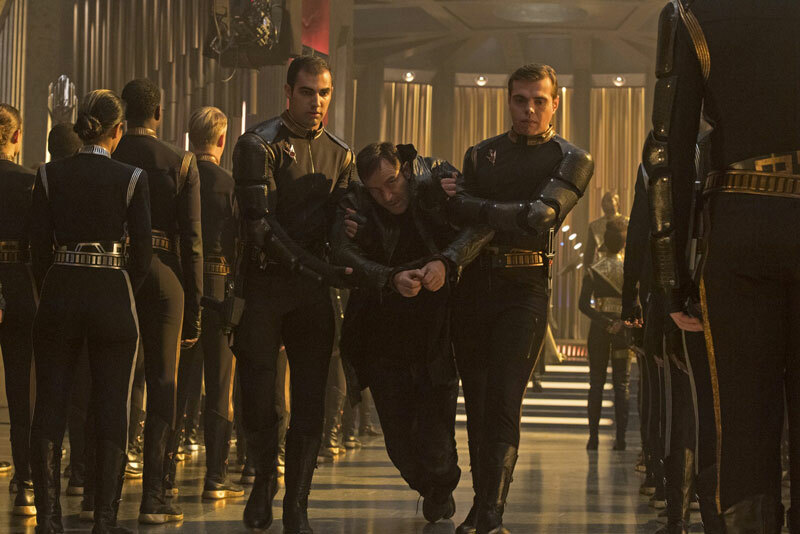 Yes, we now know Lorca is originally from the Mirror Universe. 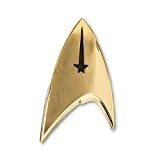 Not completely surprising considering the captain’s bellicose nature, but confirmation is key here, and opens up new questions, such as how Lorca traveled from the Mirror Universe to the Prime Universe. And where is the original Prime Universe Lorca? These questions will surely be answered in next week’s episode, but kudos to Jason Isaacs for making us question the character’s origin with such a delicate yet powerful performance. Now that the secret is out, it’ll be interesting to see how Isaac plays the character. Will the air of mystery vanish, or will he still walk the fine line and make us question the character’s true motivations? Elsewhere in the Mirror Universe, Stamets finally wakes up from his long, spore-induced nap thanks to the help of his Mirror Universe counterpart, whom he encounters in the mycelial network. And it’s in the network that we get the episode’s most poignant scene: the heartfelt goodbye between Stamets and Culber. It’s certainly better than the mindless Stamets holding Culber’s lifeless body in the dark hallway. Anthony Rapp and Wilson Cruz have fantastic chemistry in this scene, as they have throughout the show, and the return to the fan-favorite teeth-brushing scene was a nice callback to the grounded and realistic depiction of this couple. Of course, we’ve been told that Culber isn’t really dead, so it’ll be interesting to see how that reveal, in whatever form it may come, is handled by Stamets in the wake of this tearful goodbye. And speaking of couples, “Vaulting Ambition” featured more interaction on the L’Rell-Tyler front. Shazad Latif continues to kill it as Voq and Tyler, switching from crazed Klingon to scared human with unnerving ease. And while it’s unclear what L’Rell actually did to Tyler/Voq (what has the internet decided…Voyler? Toq? ), her concern for both Voq and their plan is played with convincing sincerity by Mary Chieffo. Based on her Klingon war cry at the end of the episode, one might assume Voq is dead as a result of L’Rell’s brain manipulation? Or that Voq was restored? It’s a shame we haven’t seen more of the Voq/L’Rell dynamic, but with three episodes left in season one, there’s still plenty of time for more development between these two characters. 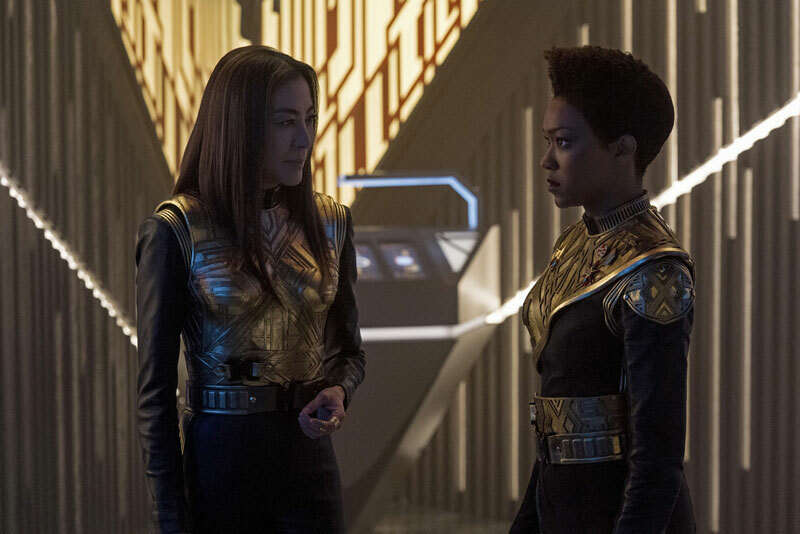 Discovery has done a fantastic job of keeping its viewers engaged throughout the season with plenty of intriguing plot developments, captivating casting, and tense pacing. “Vaulted Ambition” is no different. Outstanding performances from the entire cast help sell the increasingly intricate plot, and this expensive and expansive depiction of the Mirror Universe does great service to the little of the universe we’ve seen before. Someone on the Discovery production likes Guardians of the Galaxy. Yondu would be proud of Emperor Georgiou’s head-slicing skills. How cool is the I.S.S. Charon? Seems like it’s powered by a mini-sun. My bet is we’ll see some imagery later on that is reminiscent of the Battle of the Binary Stars. On that same note: Eaglemoss, you know what to do. Kelpiens just have no luck. Having some yummy Kelpien threat ganglia helps sell the ruthlessness of the universe. What do you think of the latest episode of Discovery? Let us know in the comments below.